This is what the portable Israelite tabernacle looked like. It was somewhat of a blueprint for the permanent temple Solomon would build, and that Zerubbabel and later Herod would rebuild in Jerusalem. It’s where Christ taught as a boy, and the place He cleansed as a man. The temple was extremely important to Christ and his contemporaries. But in the centuries after Christ’s death, the importance of temples seems to have all but completely faded from the general Christian world. Why? The most common explanation for the absence of temples today is that these ancient temples were simply part of the Law of Moses, the Old Covenant that Christ fulfilled. That’s an understandable explanation, and certainly some aspects of the temple, like animal sacrifice, were of course no longer necessary after Christ. But animal sacrifice was not the purpose of the temple, it was just the means to an end. The purpose, amongst other things, was to commune with God and symbolically enter His presence. And that is just as important today as it was back then. Just because something happened in the Old Testament does not mean it’s no longer relevant now. For example, 10 of the 613 laws that comprised the Law of Moses in the Old Testament are the 10 Commandments. The Big Ten. But when Christ came to fulfill the Law of Moses, He didn’t throw the 10 commandments in the trash, He expounded upon them. He said not only should you not kill, but you shouldn’t even let yourself be angry with others. Likewise, temples weren’t kicked to the curb. They were meant to adapt to embody the Law of Christ, the higher law. After Christ died, the thick temple veil which separated the Holy of Holies from the rest of the temple was torn from top to bottom. Some faiths interpret this as a sign that temple worship was over, outsourced by Christ. Latter-day Saints interpret it a couple of different ways. First, just as a symbol of Christ’s death, because it was only through Christ, through the veil, that the high priest could come into the presence of God the Father. If the veil represents Christ, and Christ dies, it makes sense for the veil to be torn. Second, historically, only the Israelite high priest would be allowed into the Holy of Holies only once a year. The tearing of the veil also represents an end to that practice, and the welcoming of all people, not just Israel, into the kingdom of God. Acts 17 comes close out of context, but nowhere does scripture plainly say that temple worship should be done away with. If that had been the case, the apostles wouldn’t have worshipped there. But Peter and the apostles and Paul are constantly at the temple well after Christ’s death. In Acts 22 Paul is praying at the temple and Christ appears to him in a vision at the temple. Obviously, they still considered it to be an integral part of Christian life as well as Jewish life. Temple worship continued to exist in some form even after the death of the apostles. Early texts and Church fathers record details about temple worship, and Christian initiatory practices that are strikingly similar to what Latter-day Saints do in their temples today. If Joseph Smith was just making things up on the fly, he was an unbelievably lucky guesser. That said, Latter-day Saints believe a general apostasy was well underway in the centuries after Christ’s death. Essential teachings became corrupted, and temple worship eventually became foreign to mainstream Christianity, though you do still see remnants of it in a lot of Catholic architecture, worship, and tradition. So essentially here’s the situation: In ancient Jerusalem, you’ve got a bunch of Jews, they have a temple. Christ comes, and also worships at the temple. During His ministry, all of a sudden you’ve got this new group breaking off of mainstream Judaism called Christians, who also worship at the temple. Then Christ dies, but both Jews and the leaders of these new Christians continue to worship at the temple. Christ is making appearances at the temple. Yet fast forward 2000 years and for some reason, we believe temples are irrelevant? What’s up with that?! Well, Latter-day Saints believe they’re still extremely relevant and have over 160 of them around the world. Now, if temples are still so important, the next question on your mind should be, why? And what goes on there now? Great questions. We’re going to jump into those soon in another episode. The most important reason for a temple is to provide a house for the Lord. 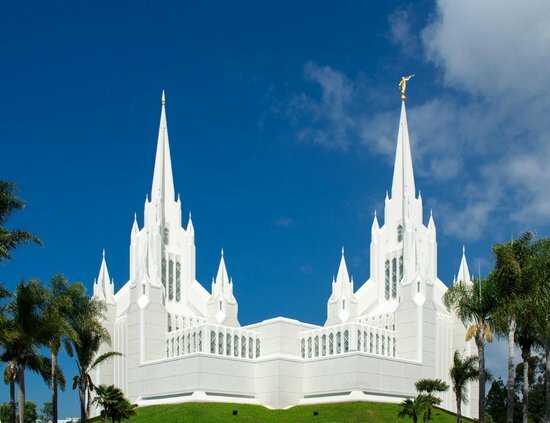 As a house for the Lord on earth, the temple becomes the connection between heaven and earth, a place set apart, reminiscent of the high mountains where prophets were taken to commune with the Lord. The spirit of God shines in temples today that dot the earth. Anyone who desires to make himself or herself worthy can enter to pray and meditate, and to participate in covenants and ordinances for themselves and their ancestors. Christ visits His temples both in Spirit and in person on occasions. Latter-day Saint temples serve both Aaronic (Mosaic) and higher priesthood (Melchizedek priesthood) functions. Baptism, as established by John the Baptist, is an Aaronic ordinance, and baptisms for the dead are performed in Latter-day Saint temples. Higher ordinances performed there, including eternal marriage, are meant to prepare individuals for exaltation in the highest kingdom of heaven.